Zum Kampf! Zum Kampf! from Max Bruch‘s 1877 oratorio about Teutoburg Forest victor Arminius. Also be sure to check out the Handel opera. September 11 in the year 9 AD marked the bloody conclusion of the Battle of Teutoburg Forest — the engagement that permanently scared the Romans off Germany. One of history’s true turning-point battles, Teutoberg Forest abruptly stanched decades of expansion that had seen Roman arms ascendant from Britain to the Levant. Indeed, the Roman commander who had the dishonor of falling on his sword at this legendary defeat, Publius Quinctilius Varus, was an experienced imperial patrician as well-traveled as the Roman standards who has been seen in these very pages collaborating with the Judean King Herod to execute Herod’s former heir. But it was in the shadows and bogs of Germany’s primeval forests that Varus made his legacy to the world, which was to have his name famously bemoaned by facepalming Emperor Augustus once news of the disaster made its way back to the Eternal City. Prior to this cataclysm, the empire had been working a years-long plan to annex fringe chunks of the vast Magna Germania beyond the Rhine and Danube rivers with its customary view towards eventually bossing the whole place. “Upper Germania” and “Lower Germania” to the west of Magna Germania already answered to Rome, testament to recent campaigns launched from neighboring Gaul;* the vast frontier beyond peopled by fractious warring barbarian tribes, with whom Rome cut strategic divide-and-conquer alliances, appeared to promise a future march of Roman glories all the way to the Baltic Sea. He had the element of surprise on his side, because his family had been such loyal Roman allies that Arminius had been trained up in the Roman army as a youth, and even held Roman citizenship. Whatever it was he experienced seems to have nurtured an implacable desire him to keep it away form his homeland. When the time came his familiarity with Roman military orders would be a high card in his hand, too. 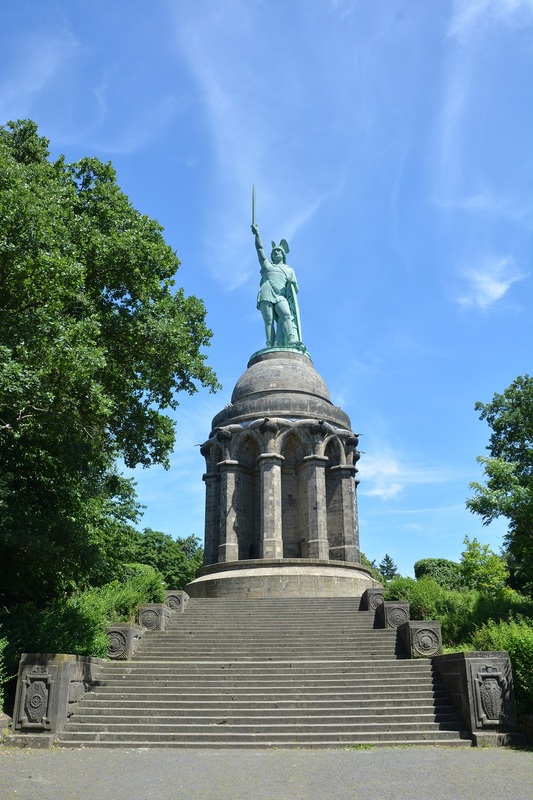 Back in Germania, Arminius maintained his overt affiliation with Rome but started sending out feelers to assemble a confederation against the legions. He played this double game so adroitly that Varus still trusted his “ally” implicitly when Arminius reported a Germanic uprising that wanted Roman chastisement. Blind to his danger, Varus duly (and with casual discipline that would read very culpably in retrospect) marched his 17th, 18th, and 19th legions out through the unfamiliar glooms of the Teutoburg Forest. It was a right massacre. Their column broken up by rough terrain and pounding autumn rains, the Romans were ripe pickings for German sorties beginning on September 9. Harried by the Germans over two days’ panicked marching, the Romans were pressed into a dead end where palisades trapped the desperate legions at the edge of a slough and put them to slaughter. A bare handful escaped to tell the tale, and no future legion would bear the numerals of those annihilated on this day. 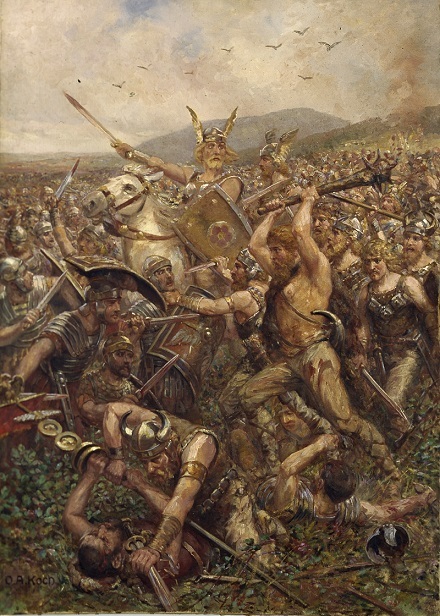 Varusschlacht, by Otto Albert Koch (1909). The scale of the defeat, by rude tribesmen the empire always counted on being able to bully, beggared the Roman imagination. To judge by Roman reports — and what gives this event a purchase on the annals of Executed Today — the battlefield rout transitioned directly to the ceremonial butchery of captives. (As well as the posthumous beheading of the suicide Varus.) While some suffered torture and execution, others were offered as ritual sacrifices to the Germanic gods who had so magnificently delivered the day. Several years later, a Roman force out to re-capture the lost standards of the Teutoburg legions reached the site of the empire’s humiliation. Tacitus describes the scene as a horror. In the center of the field were the whitening bones of men, as they had fled, or stood their ground, strewn everywhere or piled in heaps. Near lay fragments of weapons and limbs of horses, and also human heads, prominently nailed to trunks of trees. In the adjacent groves were the barbarous altars, on which they had immolated tribunes and first-rank centurions. Some survivors of the disaster who had escaped from the battle or from captivity, described how this was the spot where the officers fell, how yonder the eagles were captured, where Varus was pierced by his first wound, where too by the stroke of his own ill-starred hand he found for himself death. They pointed out too the raised ground from which Arminius had harangued his army, the number of gibbets for the captives, the pits for the living, and how in his exultation he insulted the standards and eagles. And so the Roman army now on the spot, six years after the disaster, in grief and anger, began to bury the bones of the three legions, not a soldier knowing whether he was interring the relics of a relative or a stranger, but looking on all as kinsfolk and of their own blood, while their wrath rose higher than ever against the foe. 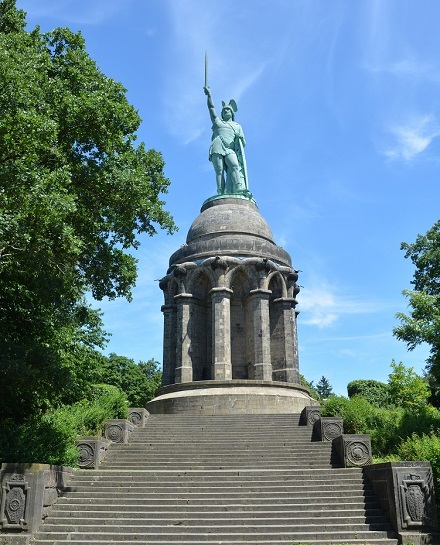 Despite the devastation, Teutoburg Forest was no extinction-level event for the Roman Empire. The Rhine and Danube frontiers remained an ongoing source of action for the many centuries to come, but despite raids and incursions here or there Rome never more seriously aspired to Magna Germania. ** Arminius — whose name has been held equivalent with “Hermann” — has been the subject of many literary celebratins in a nationalist vein, great business especially in the 19th century.